There are few things as unedifying in any aspect of life as hearing the rich demand more at the expense of the less well off, and football is no different. Ian Ayre, Liverpool FC's Managing Director has suggested that the current (equitable) distribution of the Premier League's overseas rights income should be looked at. Ayre believes that "big" clubs (which apparently includes clubs that finish 7th and 6th respectively in the last two seasons) should get a bigger share. "If Real Madrid or Barcelona or other big European clubs have the opportunity to truly realise their international media value potential, where does that leave Liverpool and Manchester United? We'll just share ours because we'll all be nice to each other? The whole phenomenon of the Premier League could be threatened. If they just get bigger and bigger and they generate more and more, then all the players will start drifting that way and will the Premier League bubble burst because we are sticking to this equal-sharing model? It's a real debate that has to happen." So how bad is the competitive gap between Liverpool and the Spanish giants? Well at face value, the gap is big and growing. 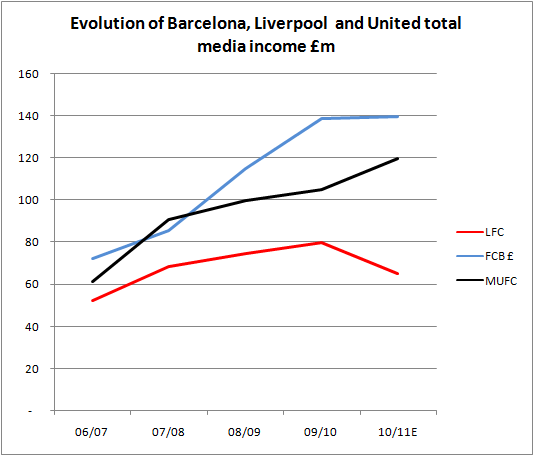 The chart below shows Liverpool and Barcelona's media income for the last five seasons (numbers for 2010/11 are derived from the PL, UEFA, FCB's account and an estimate of LFC's domestic cup income). 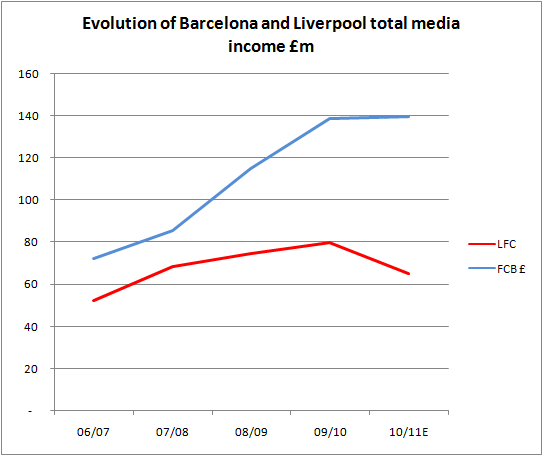 I have converted Barcelona's income from Euros into Sterling at the average exchange rate for each season. Having been £20m in 2006/07, the gap has expanded enormously to £75m last season. So what's going on? 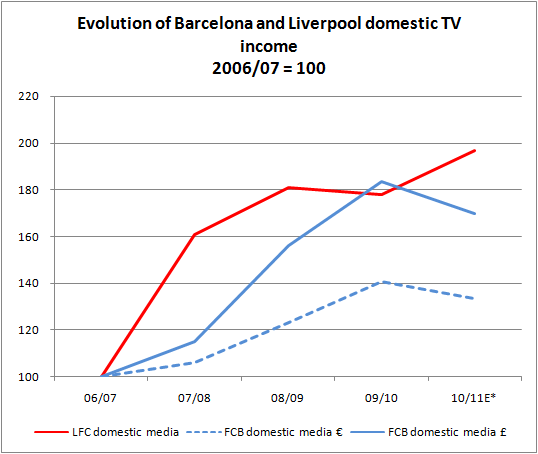 The chart above, rebases domestic league media income to 100 in 2006/7 and shows Barcelona's figures in both £ and €. From this chart it is clear that in local currency, the value Liverpool receive for domestic competitions (PL, FA Cup and Carling Cup) has actually grown faster than the equivalent in Spain. So currency plays one factor in explaining the divergence between the clubs, but there is another huge factor at play; performance on the pitch. 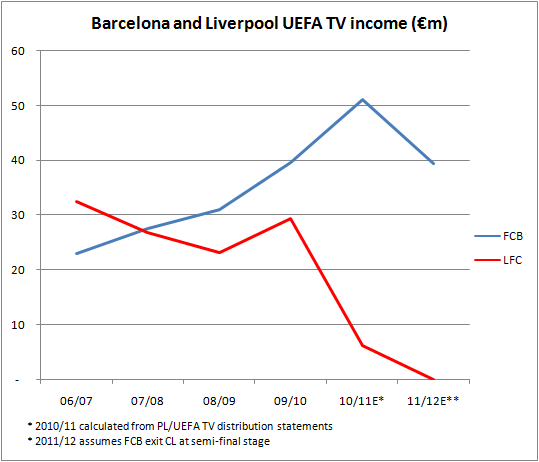 To get a sense of how the relative fortunes of the two clubs have diverged and how crucial this is to media income, consider the following chart showing UEFA TV distributions (all in €). In 2006/07, Liverpool earned €9.5m (£6.4m) more from the Champions League than Barca. 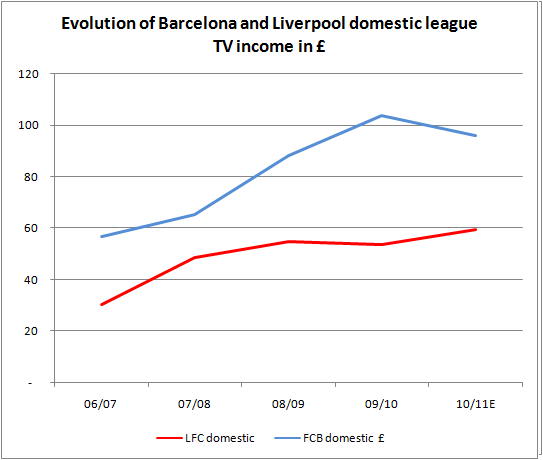 By 2010/11, the positions were radically reversed with Barcelona earning €44.9m (£39m) more from their winning CL campaign than Liverpool did from the Europa league. This season, Liverpool will earn precisely zero from Europe. Rather than bleating on about how unfair the allocation to Bolton Wanderers is, Ayre needs to look at the performance of his own club. 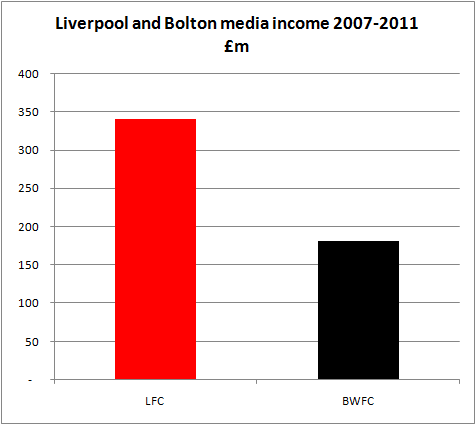 The gap in media income with Bolton over the last five years is already £159m, how much more does he want?